The CheckPrimitive is painted as three sets of angled lines and is colored using the ForeColor property. The three sets of lines are easier to see when the primitive is scaled up. 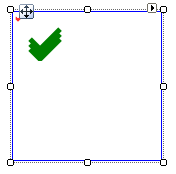 The example below creates two CheckPrimitives, one at the default size and the second scaled up by a factor of 5.